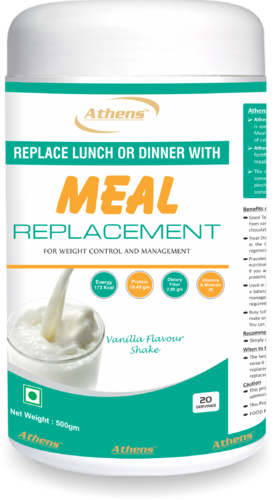 We are the leading and prominent Manufacturer and Supplier of Vanilla Meal Replacement Shake Powder. Legal Status of FirmPublic Ltd. Co. Incorporated in the year 2001, Athens Labs Ltd is a leading pharmaceutical company engaged in innovating, manufacturing and marketing quality pharma products. Athens labs Ltd is the marketing wing of its manufacturing plan “Athens Life Sciences” which is a WHO-GMP certified unit. The unit is well equipped in manufacturing high-quality products in Pharmaceutical Capsules, Pharmaceutical Tablets, Pharmaceutical Syrup, Pharmaceutical Gel, Pharmaceutical Sachets, Pharmaceutical Injection, Nutraceutical Supplements, Pharmaceutical Suspension and Cream etc.